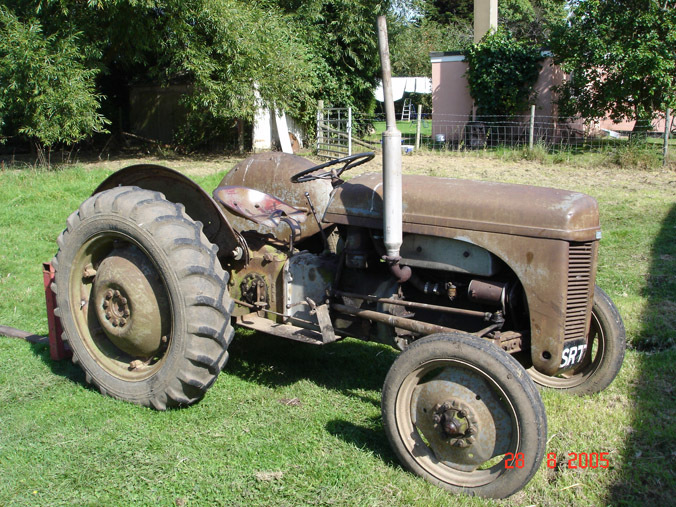 This 1955 Massy Harris Ferguson TED Petrol Paraffin was my first Ferguson tractor and was purchased with another TED from a small holding at Creeting, near Stowmarket in Suffolk in August 1998. As you can see from the pictures, it is in very good original condition, having been stored under cover all of its life. It is even complete with original tyres! The previous owner had the tractor from nearly new, and was used regularly, especially when it can to ploughing. With a two furrow Fergie plough 30 acres were ploughed nearly every year, for at least forty years! Later it was used on the drill instead of the heavier job of ploughing. It is the main workhorse and is used regularly about the yard at Rhodds’s Farm, and has proved an extremely valuable addition; and is usually found with the transport box or pallet forks on. More photographs of the tractor working can be viewed here. The tractor has had to have minimal work carried out since its purchase, besides regular oil changes; a new clutch was fitted in 2002, and minor jobs to hydraulics and ignition system have been completed.